Design Considerations - Why is tolerance important? Design Considerations – Why is tolerance important? Tolerance is always an issue that arises when designing something. Tolerances are often an afterthought but it is actually incredibly important that tolerances are considered at an early stage of the design process. During mass manufacture, the dimensions of every product will not be exactly the same. Many aspects of manufacture may affect the size which is why tolerances are so important. Tolerances dictate by how far the size can vary. Tolerances will depend on any other external components that come into contact with the component. Take for example the green square block. At the moment the square block is slightly smaller than the square hole. This is so the square can fit through the hole easily. Let’s say that the tolerance for both the hole and the square is an unusually large +/- 5mm. Say the block is 40mm and the cut out hole is 42mm. The +/- represents how far the dimension can change in each direction. So in this example the square can be a minimum of 35mm and a maximum of 45mm. If the square block was made to its maximum of 45mm this means that it would not pass through the 42mm gap. This would be an example of bad tolerance. However if this tolerance was instead +/- 1mm this would mean that the shape would definitely fit because the maximum it could be is 41mm. Now let’s take a look at the tolerance of the square hole. Even if the block has a correct tolerance, the square hole still must also have a tolerance. For example if the tolerance was again +/- 5mm this would mean that the hole could be at its smallest 37mm. A block of 40mm (+/- 1mm) would never fit through this. This is why tolerances can get very complex. For every component or part involved in a design, tolerances must be rigorously checked in order to ensure that the design works. This is a key aspect of design consideration that should not be overlooked. Manufacturing processes are not perfect enough for exact dimensions to be achieved every time. Many manufacturing processes involve shrinkage after shaping as the material contracts at room temperature. This is why there is fluctuation in many shape sizes. Unfortunately tighter tolerances increase the cost of production. 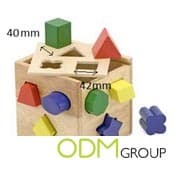 Here at ODM we understand how tolerances work and know which tolerances are important to ensure the product fits suitably. Tolerances have a big impact on the selection of production processes, and the ability of the factory to be able to assemble the final product, which is why we work so closely with factories to ensure they understand the tolerances and our expectations from them.